This year is different. I’m going to get organized, keep every loom dressed, and bake fruit pies for my husband! Alas, good intentions are not a reliable measure of what my progress will be. I always want to do more than what I manage to get done. Before washing and drying the fabric I examine it. I look for errors and clip off any weft tails. I cut the placemats to a uniform size. 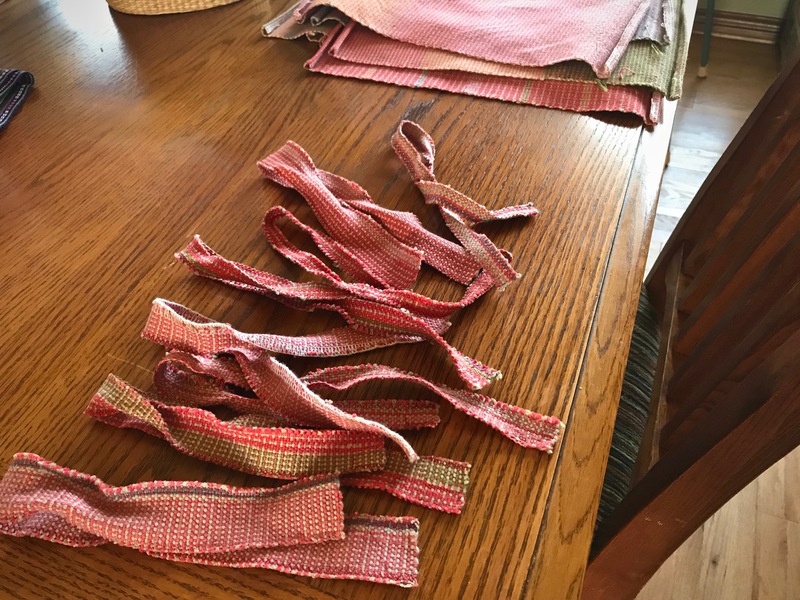 Scraps that were cut off will be used as ribbons to mark luggage for my daughter’s family as they prepare to travel. 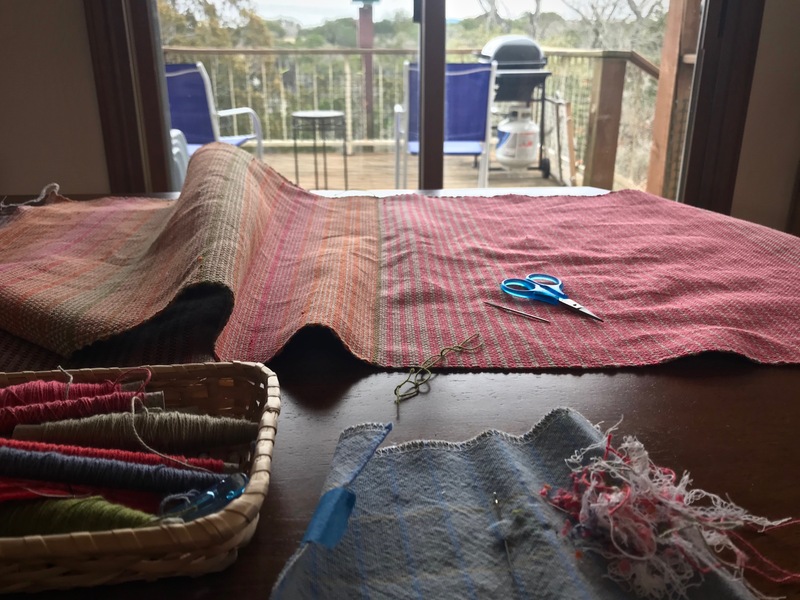 I simply zigzagged the edges of the scraps. 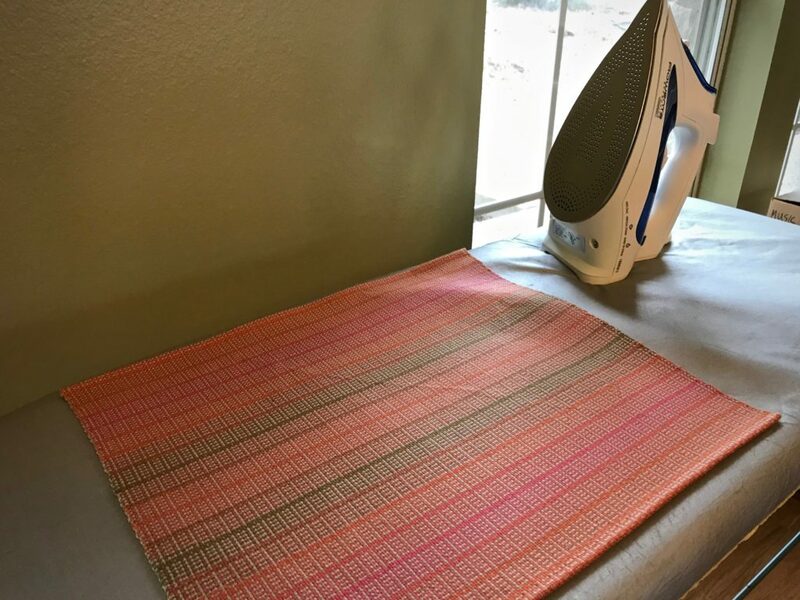 I washed, pressed, hemmed, and pressed again the twelve placemats. Finishing is finished. It’s a nice way to end one year and start the next. Measurable progress. Pressing in the dining room. 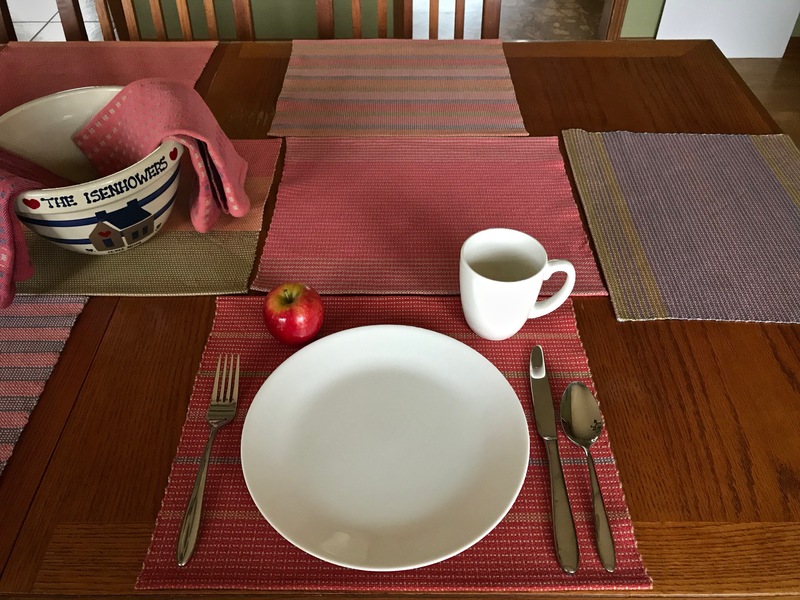 Twelve handwoven placemats. No two alike. Basket weave, color and weave effects. 8/2 cotton warp and weft. Thankfully, our value isn’t wrapped up in what we accomplish. Or what we don’t. We need the Lord’s grace. It’s strength that’s beyond our own strength. Grow in grace. Grow in strength. That’s my prayer this year for you and for me. May your value be wrapped up in grace. Would love to have you sit at our table! Grace-filled and beautiful new year to you and yours! Very pretty! Happy New Year, Karen! Hi Beth, It is so sweet to have you here. Thank you! Thank you for the past year. I like the grow in strength and grow in grace! May you and your loved one travel light and always find your way home. God speed in the New Year! Hi Rachel, What a kind thing for you to say – “travel light and always find your way home” – very comforting thought. Blessed New Year to You and Yours! Hi Gayle, a Blessed New Year to you, too! Happy New Year! Blessings to you and yours through the coming year. Thank you, Ruth! Happy New Year to you! Thank you for your prayers, Karen. I can always use more grace and strength. Clever idea for the placemat strips. I will pray for your a safe journey for your family and happiness in their new home. Hi Annie, I appreciate your prayers, too. They will be leaving soon! Hi Cynthia, Thank you so much! We really enjoy it here. Hope to share our table with you, too! Beautifully said and beautiful work! Thank you! Hi dear Elisabeth, Happy New Year to you and your family, too! It is a marvel how the same resources used can become so may different things. 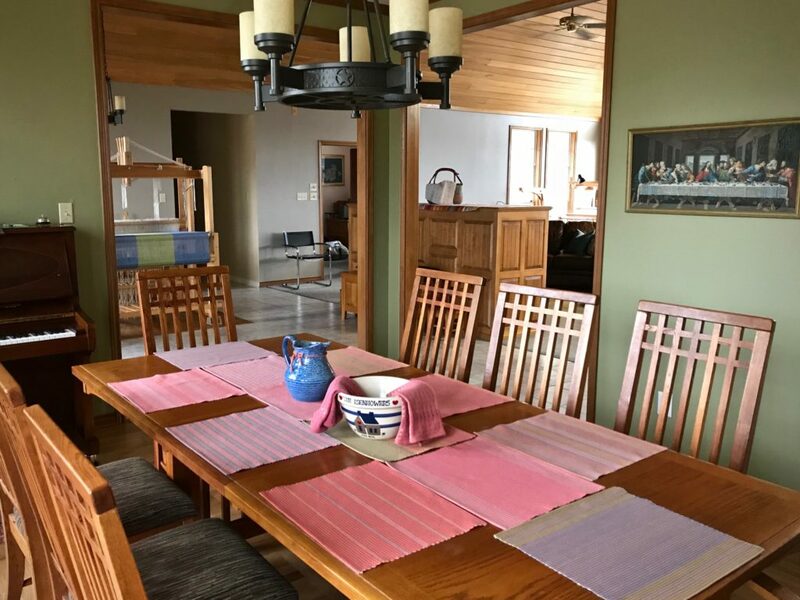 The beautiful place mats are from the same resources, but are so different. They represent your application of the gifts from God. Previent grace is such a blessing. Hi Nannette, Your thoughtful response is touching. I also thought of the people who will be sitting at the table — many similarities, yet so different from each other. It’s fitting that each person has a unique place setting at the table. Happy New Year Karen, I hope it is filled with joy! Thank you, Liberty, Joy is a wonderful thing to hope for! Your table looks lovely, Karen! You must have all the boxes unpacked! We will miss you at WOW this week, but we wish you a very happy and productive New Year. I will miss being with all the ladies at WOW! Absolutely gorgeous! Best wishes for happiness and good health. Hi Shari, Thank you so much for the kind words!